NativeHQ wins Theatre Multiplatform award! 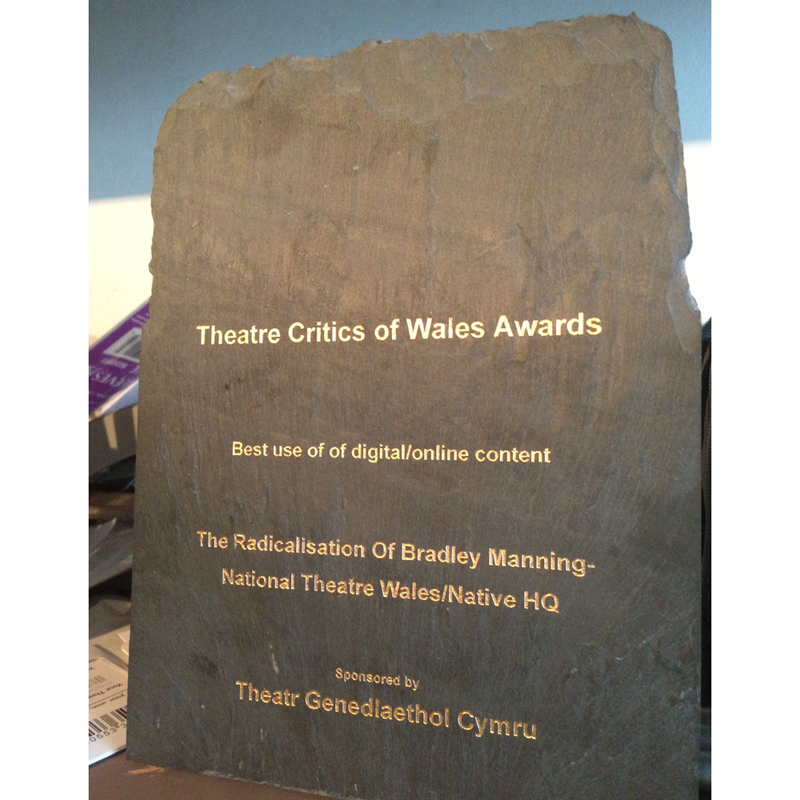 Big thanks to the theatre critics of Wales for giving us an award for the best use of digital/online content at the inaugural Theatre Critics of Wales Awards in Cardiff this weekend. 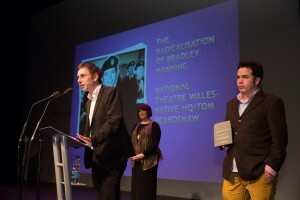 We won it for our work with National Theatre Wales on The Radicalisation of Bradley Manning, by Tim Price. We designed an online project that created a native web experience of the play by embedding CCTV cameras into the set of the show, livestreamed the play and gave the online audience a chat space to communicate with each other and external links for viewers to explore the story in more depth that changed throughout the play to reflect what you were watching. With Wikileaks, Anonymous and the Bradley Manning Campaign all tweeting links to the web production, nearly 10,000 people watched the play as it was beamed from Tasker Milwood school in Haverford West, Cardiff and Connah’s Quay in North Wales. On the final day of the show in North Wales, someone in the council switched off the internet for the weekend, so we were left streaming the production through a 3G phone tether! Bradley has nearly been in prison without a full trial for 1000 days. It now seems very likely that he did indeed leak the documents that he has been accused of sending to Wikileaks and with many Americans baying for blood, it’s is likely he will face a jail sentence. But having been a catalyst for the Arab Spring and brought the truth of American action in war and foreign policy thinking to global awareness, it seems like this Welsh Geek has done more in his young life to change the world than most of us ever will. Many thanks to everyone involved in the production – Lucy, David, Jacob and Mike, to the creative team Tim, Chloe, Natasha, Mike, the cast and crew, and special thanks to John McGrath, the artist director of National Theatre Wales, for his vision and bravery in making NTW one of the most innovative digital theatre companies in the world. Find out more about the campaign to support him through his ordeal by visiting the Bradley Manning Support Network.